Clean drinking water is crucial if you want to avoid dehydration and stomach parasite during any outdoor trip into the wilderness. As you cannot drink straight from streams and lakes, you need a treatment method to get pure drinking water when you are in an extended outdoor adventure. A good hiking water filter protects against bacteria, protozoa, and different pathogenic micro-organisms. To keep you hydrated and free from waterborne diseases, there is a wide range of water purification systems for hiking. Here, we’ve come up with a list of ten best hiking water filter to help you find the best option. A water filter is a crucial consideration to get pure drinking water for an extended trip into the wilderness. Which one is the best water filter? When you are shopping for a good water filter, you will get confused as there are a lot of options. Here we are going to talk about ten best hiking water filters. We will talk about their reliability, treatment capacity, speed and ease of use. We hope you find this best hiking water filter article helpful. 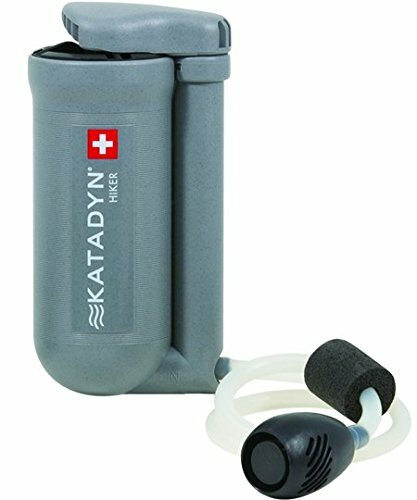 Katadyn Pocket Microfilter is the top-selling emergency preparedness water filter. It is made and engineered in Switzerland with the highest quality. 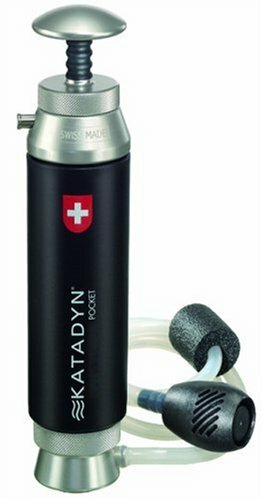 Katadyn Pocket Microfilter robust water filter is perfect for long-lasting use, even under extreme circumstances. There are a few micro wat3.78541178er filters that come close to the excellence of the Katadyn Microfilter. It is specifically designed for international travelers, outdoor enthusiasts, camping, fishing, backpacking, paddling, biking, and the U.S. Military. Katadyn Micro filter’s silvered ceramic element is effective in removing protozoa, bacteria, chemicals and toxins, all sediment and particulates. To produce clear and drinkable water it can filter all kind of microorganisms which are larger than 0.2 microns. Depending on water quality the ceramic filter can filter up to 50,000 liters (13000 gallons). Overall, the Katadyn Pocket Microfilter is tremendously durable, higher quality or longer lasting performance and also with a 20 years warranty. Sometimes water filtration is time consuming and annoying process, but Platypus GravityWorks water filters make it fast and easy. It’s gravity-fed, high-capacity; hollow-fiber water filter system is perfect for family and group camping, outdoor enthusiasts, and emergency preparedness. Platypus GravityWorks Water Filter engineered with all EPA & NSF guidelines for the removal of microorganisms such as Protozoa, Bacteria E. Coli, Salmonella, Cholera and more. 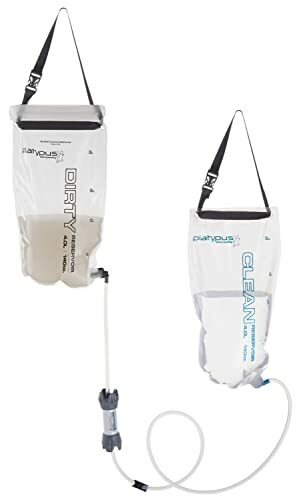 It includes a replaceable water filter, quick-connectors, a flexible tube conveying water with valve, and two reservoirs to contain pre-filtered “dirty” water and post-filtered “clean” water. No pumping required; you can fill the dirty water reservoir easily. To get drinkable water just fill up the dirty water reservoir and hang it above the clean water reservoir. You can get 4 liters of filtered water just in 2.5 minutes! 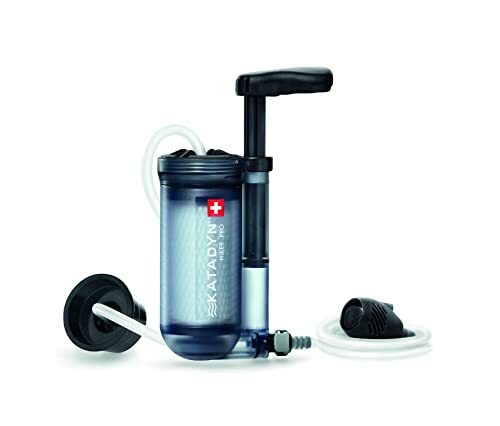 The Katadyn Vario Water Filter is the most long-lasting pocket filter available. Made of the highest quality construction. For over half a century the filter has been trusted on countless expeditions and backcountry trips. It is built for lifetime abuse. Infect Katadyn Pocket is the only water filter that comes with a lifetime warranty. Most water filter last around 200 gallons before cartridges need replacement but Katadyn Vario Water Filter can filter 13000 gallons (50, 000 liters) that’s over 60 times durable than a typical water filter. The ceramic filter removes harmful microorganism and sediment. Katadyn ceramic filter can be cleaned over and over again that’s why it lasts so long. The pocket filter performs in the most challenging condition. 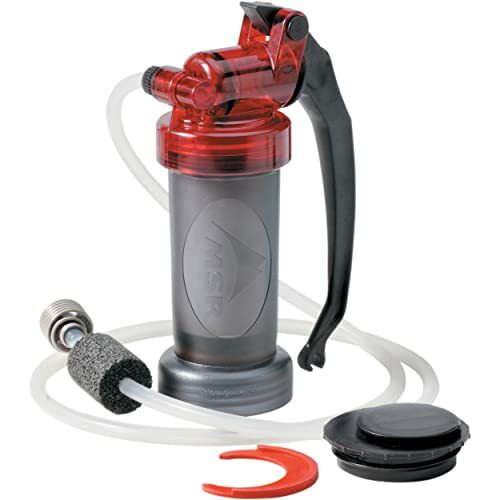 The filter is very easy to use, simply place the input hose, pre-filter into untreated water connecting output hose to a water container, and pump. Katadyn Vario Water Filter is the best choice if are looking for lifetime product. This filter is not designed to remove chlorine. 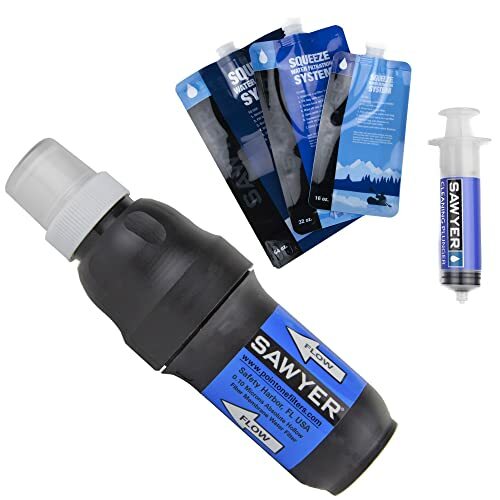 Whether hiking, hunting, fishing, camping, traveling abroad, long day hikes, overnight camping trips, or emergency preparedness the Sawyer Squeeze Water Filtration System will make sure you have access to clean drinkable water in the backcountry or anyplace in the world. This is the lightest and packable filter available. The dimension of Sawyer Squeeze Water Filter is just 9.5 x 4 x 3.5 inches and the weight is only 3.2 ounces (90.72 gram). The filter is very easy to use, first select pouch as your choice and then fill with water. Next, screw the filter on your pouch, then you ready to filter. The Squeeze Water Filter can be used many different ways you can drink directly from the filter, you can fill up your bottle and can fill up your friend’s bottle! You can get clean water for cooking instantly. The high number of those minute tubes and their surface area allows the filter to have one of the best flow rates in the world. The filter does not filter viruses. 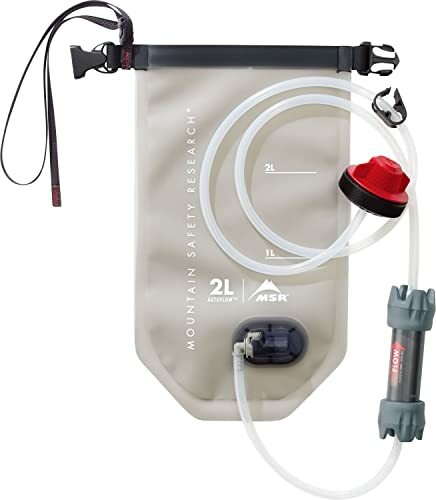 Perfect for backpacking team or small groups the MSR AutoFlow Gravity Filter is an alternative option to slandered pump filter. This system uses high-tech hollow fiber technology to quickly and efficiently remove all sediment and nasty bacteria from your water supply. With the auto flow system, you get a bunch of different parts but they work simultaneously to provide effortless filtration. The filter is very easy to use. No need any kind of pumping it uses the power of gravity. Just fill up the reservoir with untreated water, attach the hose filter and output hose, hang up the reservoir above the clean water reservoir. Let the system work. Shutoff hose clamp on the water hose allows controlling for filling bottles or fresh reservoir. Clamp can shut off the system when not in use. MSR AutoFlow Gravity Filter is the best choice if are looking for Gravity Filter product. The MSR MiniWorks EX Microfilter is the world best selling microfilter delivering long-lasting field-maintainable water filtration in challenging environments. It has been verified by thousands of adventurers worldwide. Engineered for frequent and heavy use, it utilizes a workhorse many works, ceramic element to reliably ensure clean, safe and testy water. The MSR EX Microfilter is compact and lightweight enough to take an outdoor adventure such as hiking, camping, backpacking, travel, and also for survival, emergency preparedness. AirSpring Accumulator is capable of pumping 1 liter per minute and the flow rate can be changed easily and repeatedly in the field with no tools necessary. Carbon core removes distasteful tastes and odors caused by organic compounds, such as chlorine, iodine, and pesticides. The MSR MiniWorks EX Microfilter engineered with NSF protocol P231 for elimination of bacteria (99.9999%) and protozoa (99.9%), all through its replaceable filter life of 2,000 liters. The USA made the product is included with a storage bag and a limited lifetime warranty. The Katadyn Hiker Pro Transparent Microfilter is a high-performance lightweight water filter built for quick and efficient use in the backcountry. The Hiker Pro Transparent Microfilter packs up to a convenient size. Transparent covering lets you see the filter machinery in action and provides visibility when the filter is filthy and requires cleaning or replacement. You can clean the filter screen to keep the filtration rate at high performance. The Katadyn Hiker Pro Transparent Microfilter pleated glass filter has an integrated carbon core that makes water tasty and odors, flavors, and chemicals from water. Even cloudy water is tasty and clear when using the Hiker Pro. It takes about 2 minutes to filter 1 liter and the filter maintains performance even after heavy use in silty water. It takes approximately 48 strokes to provide 1 liter of drinking water. If you’re looking for a durable and economical water filter the Katadyn Hiker Pro Transparent Microfilter has been around since it was marketed under the Katadyn brand. Katadyn Hiker Microfilter is one of the most dependable filter options across a large range of backpacking scenarios. Clean and pure water, at anywhere! Simply place the input hose end and pre-filter into untreated water and screw or connect output hose to a water container and pump. You get approximately 1 liter of clean water per minute if you’re pumping at a good clip. It is found that the Katadyn Hiker Microfilter works faster and is easier to use than any other typical filter available. As a durable and dependable pump filter, Katadyn Hiker Microfilter successfully eliminates bacteria, protozoa, cysts, and organic compounds. It is engineered with AntiClog pleated cartridge made of glass fiber which includes activated carbon granules. An activated carbon granule in the core of the filter improves the taste and removes chemicals from your drinking water. 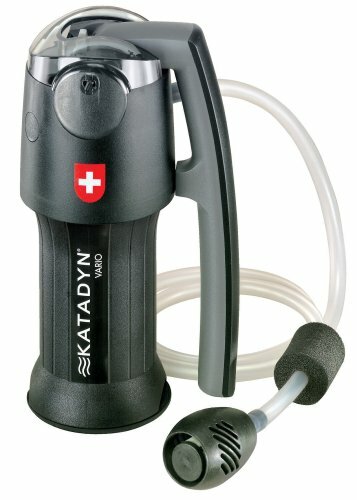 Stay healthy and happily hydrated as you hike through large patches of wilderness thanks to the pump-action Katadyn Hiker Microfilter. The Survivor Filter PRO is great for filtering water for larger groups of people or a single person at the campsite. The Survivor Filter PRO is small, strong, and lightweight, making it the great addition to any bug-out-bag or urgent situation kit. It is said that Survivor Filter PRO is 10 times better than any other water filter available. 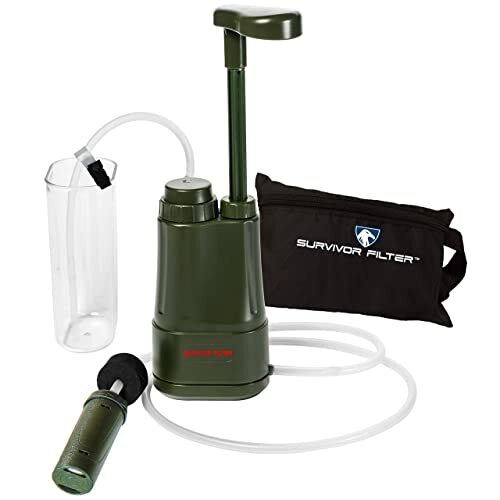 The Survivor Filter PRO uses a 3-step filtration system for filtering water. 1. Pre-Filter: The pre-filter has a rating of 0.1 microns. That means all bacteria, protozoa, and algae will be removed by it. 2. Carbon Filter: Heavy metals and chemicals from the untreated water will be removed by the carbon filter. Almost no other water purification process can do this. 3. Ultra Filter: The last stage is a 0.01-micron filter. This filter will remove almost all viruses from water. This filter far exceeded your expectations and you can travel anywhere without any issues from the water. Everyone that has come into getting in touch with it is equally astonished at how small, simple and strong it is! The award-winning LifeStraw Steel Personal Water Filter technology has developed with the adding of a 2-stage filtration system. In addition to the hollow fiber membrane found in the LifeStraw Steel Personal Water Filter, which filters out 0.2 microns microorganism such as, all bacteria, protozoa, Salmonella, E-Coli, Giardia, Cryptosporidium and also eliminates contaminants as well as odors and tastes. Replaceable activated carbon capsule reduces chemicals and organic compounds. 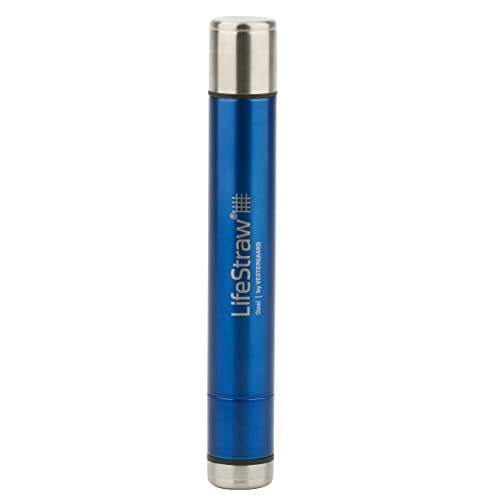 The LifeStraw Steel filter is 9 inches long with 1inch in diameter. It has a pretty lightweight stainless steel body which makes it heavier. The LifeStraw Steel filter needs no batteries or chemicals, no pumping or waiting, providing quick access to clean drinking water on-the-go from rivers, lakes, and streams. Having a LifeStraw Steel Personal Water Filter on hand gives you access to safe and clean drinking water in the incident of a natural disaster or survival situation or any emergency preparedness. There is no one best hiking water filter system that is universal. However, there are a lot of fantastic and versatile options out there for your hiking purpose. For this reason, our experts have carefully researched and chosen up the top ten models. We hope anyone of this list is going to be a great option in your next hiking trip. Our experts have spent hours researching these treatment methods and they also talked about their pros with cons, therefore we hope you find this article helpful.